This sphinx statue of Hatshepsut, a female Pharaoh, is in the Metropolitan Museum in New York. I used this picture because the British Museum doesn’t have any statues of Hatshepsut, who many believe is the daughter of Pharaoh mentioned in Exodus chapter two. Hatshepsut reigned in the time period preceding the Exodus of Israel from Egypt. The daughter of Thutmose I, she was the wife of her half-brother, Thutmose II. 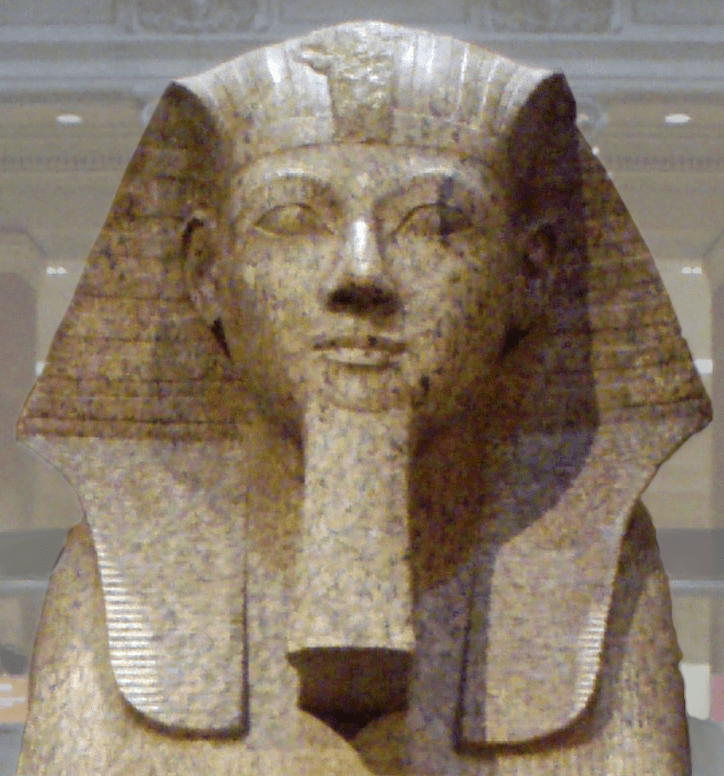 When he died, she became co-regent with her young step-son, Thutmose III. She eventually seized power and reigned as Pharaoh herself until Thutmose III replaced her on the throne. This obelisk is in the British Museum (room 65). Obelisks were monuments to the sun-god. This obelisk was later apparently reused (in three pieces) as building material (description of the obelisk on the British Museum website). Hatshepsut was particularly prolific in commemorating herself with monuments, statues, etc. This was normal for the Pharaohs, but she seems to have been exceptional. Perhaps as a usurper she felt insecure. Sometimes the less confident a person is in their position, the harder they work to assert it. Only one side of the obelisk was inscribed, and the names of Hatshepsut have been erased, as happened to many of her monuments. Many of her monuments were defaced not long after her death, which is highly unusual in Egyptian history. The description of Pharaoh’s daughter in Exodus is intriguing. Her father ordered the death of all Hebrew baby boys. She rescued one from the Nile. The ruler of all Egypt enslaved and killed Hebrews, and she brought one into the palace. Whoever she was, she doesn’t appear to have been hindered by what others said. If she wanted to do something, she did it. Hatshepsut supports the credibility of the Exodus account. Whether or not she was the daughter mentioned in Exodus, she proves that at least one woman in the royal palace had the effrontery to do these things. She was willing to seize power, fill Egypt with her statues wearing the royal false beard, and put her name on monuments everywhere. She didn’t care about conventions or respect for authority — she did what she wanted. Hatshepsut may not be the “heroine” of Exodus 2, but she certainly proves that a person with those personality traits existed. “Moses and Hatshepsut” from Biblical Archaeology has an interesting discussion of the possibility that Hatshepsut was the Pharaoh’s daughter mentioned in Exodus. Sometime after the death of Hatshepsut, many of her monuments were damaged. Her name was chiseled away, and replaced with Thutmose I or Thutmose II in many cases. On some statues, the false beard was broken off, and in some memorials there is a gap where the image of Hatshepsut was formerly. Why? One theory is that Thutmose III ordered this out of revenge for her usurpation — but many monuments were left intact, with only her name replaced. The revenge motivation certainly could be accurate, but there are several problems with it, and not everyone is persuaded. For those of us who accept the Biblical account as true, another theory, which can probably never be proved, would fit the Biblical record well. If Hatshepsut had rescued Moses, the defacing of her monuments may have happened after the departure of Israel from Egypt. All Egypt had been destroyed (Exodus 10:7), and their army obliterated at the Red Sea (Exodus 14), and Moses must have been the most hated man in all of Egypt. Hatred towards him may have extended to the memory of the woman who had adopted him. If Thutmose III was the Pharaoh at the time of the exodus, his stubborn resistance to the Lord while Egypt was being destroyed would not have made him popular, either. So perhaps Amenhotep II had Hatshepsut’s name removed from her monuments and replaced with the names of her father or her half-brother/husband, Thutmose II. We’ll probably never know for sure the connection, if any, between Hatshepsut and the Exodus account. What we do know of her sheds some interesting light on the character of Egypt’s royal family at a point when Egyptian royal history and the Biblical record intersect. This entry was posted in Bible in British Museum and tagged Hatshepsut, Moses. Bookmark the permalink.